We are beginning a monthly feature on our beautiful brides. We HAD to start this blog series with something amazing and Annie and Greg's wedding provided just that. 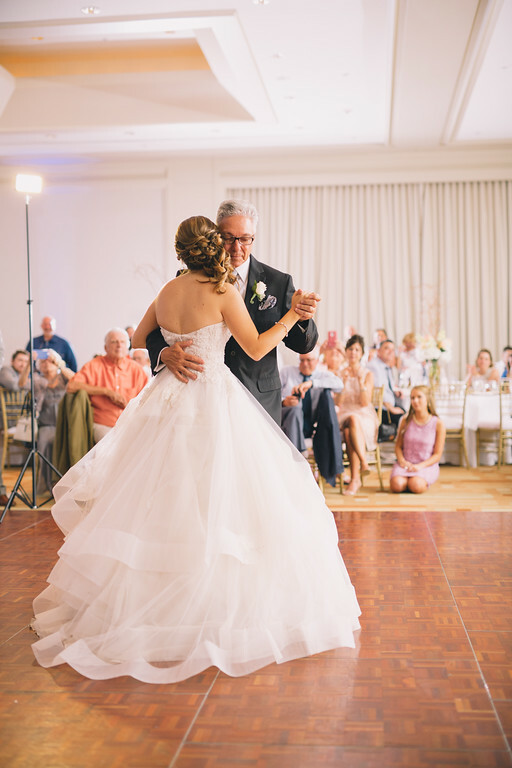 Annie came to Isabel O’Neil Bridal Collection in the hopes of finding the perfect gown for her dream wedding and that is exactly what she received. When I first asked Annie for pictures from her wedding day she was so excited to share her special day with us. Her bright personality shines through even over email and was perfectly captured in their wedding photos. They have a stunning 8 year old daughter with whom her husband did a first dance (cue the tears). 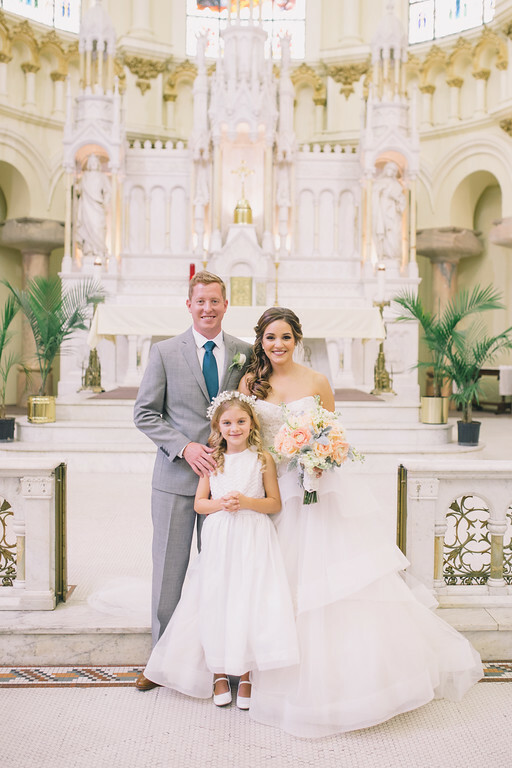 The couple got married at Sacred Heart Church in Tampa, Florida. Alyssa: How did you and your husband meet? Annie: Greg and I met through mutual friends while I was down in Orlando for an internship the summer going into my senior year of college. Alyssa: What is your favorite memory with him? Annie: My favorite memory I have with Greg is probably the night we met. I was with a group of my friends who knew some of his friends. He was joking around and dancing so I walked up to him with possibly the worst pick-up line ever, something completely sarcastic along the lines of, "nice dance moves." He will never let me live that one down. We talked for a bit, exchanged numbers and the rest is history. Alyssa: Describe your experience at Isabel O'Neil. Annie: Isabel O'Neil Bridal Collection far exceeded my expectations. From the minute I walked in the door MaryIsabel and Alex were there to help me ever step of the way. They were there helping me find the perfect dress and were there on the day of my wedding to answer my frantic phone call when my mom couldn't figure out how to do my bustle, even though Alex had just practiced with her the day before. The ladies at Isabel O'Neil are there for one reason, to make sure the bride leaves happy with the dress of her dreams. Alyssa: How did you know this was THE dress? Annie: I knew as soon as I put on my dress that it was the one. It was fun, different and unlike any other dress I had seen. It was only the second dress I tried on so we went ahead and tried on a few more but all I wanted to do was get back into what I knew was THE dress. We put it back on and added the veil, it was a done deal. At Isabel O’Neil Bridal Collection we constantly catch ourselves saying that we have the best brides ever. Stories like these just solidify that for us. Every weekend we say hello to new brides in search of their dress. In the same day we send off another bride who over the past year has purchased her dress, went through fittings, searched for bridesmaids dresses, and leaves for their wedding day. Our boutique lends itself to having a personal and welcoming experience. Our brides really do become our family and we are so happy that Annie and Greg found their family in each other.